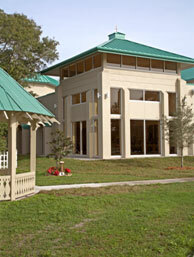 The campus has 28,000 square feet of inspiring architecture, supported by modern, high-tech A/V equipment, theatrical lighting, computers, lecterns and furniture needed for religious services. 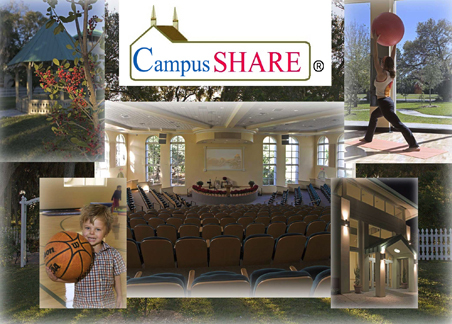 ChurchSHARE provides high-quality worship space to Bradenton-Sarasota Florida faith-based communities on a shared basis. Sharing space reduces facility cost and provides empowering amenities at a fractional cost. 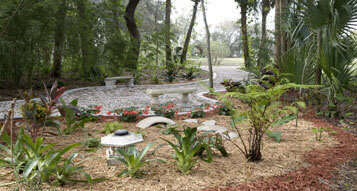 The campus is a serene setting in the heart of Bradenton. Its 700 trees and protected wet lands offer a sense of peace and tranquility. 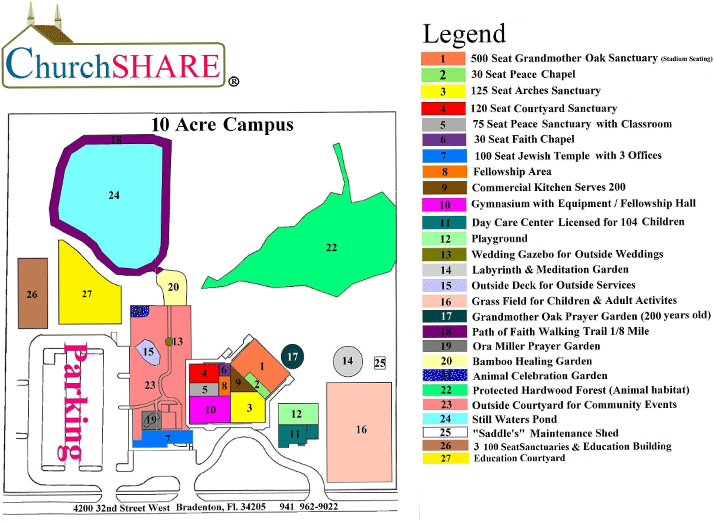 There are several sanctuaries (see site layout) ranging in size from 50 to 500 seats supported by classrooms, commercial kitchen, gymnasium, labyrinth, walking trail, prayer gardens, pond and ample parking.! Sharing worship, fellowship and classroom space can save 50% over single use facilities. Utilities, janitorial supplies, insurance, ground maintenance and other indirect expenses are reduced as well. Space can be a powerful tool. Sunday school is an example. Without classrooms, nursery, gymnasium, and playgrounds it is difficult to attract families with children. It’s like the "chicken or egg question," which comes first? Many parishioners are uncomfortable attending a church located in a hotel, storefront or public school. Worshipping on a seven million dollar church campus empowers your congregation. Sharing for a period of time allows you to financially strengthen as a spiritual community before taking on the responsibility of ownership. 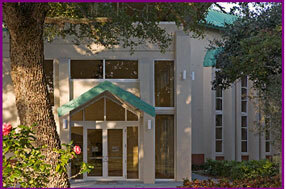 It will help put your losses in check and begin saving for the down payment on your own, free-standing church building.